Alcudia passenger and car ferry ticket prices, timetables, ticket reservations and information for ferries sailing from Alcudia to Barcellona, Ciutadella and Mahon . Compare all available Alcudia ferry ticket prices in real time and book the cheapest available Alcudia car and passenger ferry tickets sailing to and from Alcudia, Barcellona, Ciutadella and Mahon with Balearia ferries online with instant confirmation. 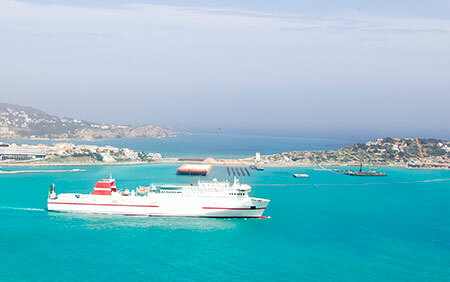 Book Alcudia Ferry Tickets with Balearia for ferries sailing from Alcudia to Barcellona, Ciutadella and Mahon online in advance to enjoy the cheapest available ferry ticket price. The price you see is the price you pay. There are no hidden extras or surprises such as added fuel surcharges or booking fees and we do not charge you anything extra for paying with a Visa Electron card. The price we quote you for your selected Alcudia passenger or car ferry ticket, onboard accommodation and vehicle type is all you will pay, and that's a promise. To obtain a Alcudia ferry ticket price and book your ferry ticket securely online please use the real time ferry booking form on the left. You are also able to add a hotel at your destination, or anywhere else, to your ferry ticket when completing your ferry ticket reservation. Situated on the North-East coast of Majorca Alcudia is one of the most popular Balearic resorts with English-speaking holidaymakers. Alcudia has miles of golden sands stretching rom the Port of Alcudia through to Playa de Muro. The port area is relaxing by day and by night, and there is a wide choice of bars and restaurants which offer local Mallorquin, as well as other Mediterranean and European dishes. But don't worry you can also get your full English (or Scottish) breakfast, roast beef and Yorkshire pud, and of course a pint of bitter. The area around the Belle Vue apartments is very popular with the English-speaking holidaymakers and there is a host of bars to pick from, many offering food and/or evening entertainment. This is where a a large part of the nightime entertainment takes place. And it’s in spruce resorts like Alcudia where it’s not hard to realise just why this sunkissed landfall remains our favourite holiday island. The town of Alcudia and the unspoilt areas to its north are really the places to enjoy sights (as opposed to the port). The walled town and the church of Sant Jaume and the Roman ruins of the Ciudad Romana (Roman town) lend Alcudia its strong historical heritage. The Roman town is a significant archaeological site, dating from the late second century BC, the exact date being put at 123BC when Pollentia (its name) was founded by Quinto Cecilio Metelo (after whom a rather uncharming street has been named). Pollentia was subsequently subject to development and destruction in fairly equal measure, and from the third century there was a lengthy period of “decadencia”, which means as it sounds in English but also translates as decline, though one suspects there was fair degree of decadence too. Nowadays it is possible to determine the general shape of the town and its street layout as well as the forum and temples. The Roman theatre followed some while after the founding of Pollentia, at the end of the first century AD to be precise (or rather to be fairly imprecise). It exhibits three elements that demonstrate it was indeed a Roman theatre and not a Greek one, as was initially thought when it was excavated in the early 1950s; these elements being - the “cavea” (the terraced seating) in a semicircular form, the “orchestra” and the wooden “scaena” (stage), raised slightly higher than the orchestra in front of it. There is also another excavation dating from Roman times, Portella. This was a residential area which appears to have been developed in the first century AD and a wall added around the third century. No archaeological site worth its name can do without its own museum, and so the Museo Monográfico de Pollentia was established in 1987 in what was an old hospital. peaceful, scenic and indicative of the “unseen Mallorca”. With a seven mile long beach to call its own, Alcudia was always destined to be vacation central. Add to that its warm waters, great shopping and family-friendly, traffic-calmed promenade, and you’re looking at a little slice of Balearic paradise. And so close to the majestic Majorcan countryside, too. The island’s rocky heart reaches its pinnacle at the soaring Tramuntana mountain range, just out of town – and this is a real A hiker’s paradise. Follow the foothills around the lush north of the island, and you’ll discover medieval villages where, in sub-dappled squares, local craftspeople carry on their daily lives much as they have for centuries. Seek out their fine ceramics or blown glass for good value souvenirs – or perhaps a bottle of two of the island’s excellent wines. They’ve been harvesting grapes here since the Romans arrived, plenty of time to get it right. But, as ever, family holidays to Majorca always return to the beach. And, in Alcudia, you’ll be spoiled for choice, wherever your wanderings take you. During the day the narrow streets of the quaint medieval town of Alcudia are filled with many day-trippers who marvel at the heritage listed town with Roman and Moorish influences. The visitor get the impression of moving in a single stone open-air museum within the closed architecture of Alcudia. Particularly impressive are the massive fortifications some of the 13th centuries and are still passable. Another attraction outside the city is the Roman excavations of the city Pollentia, which was founded in 70 BC. Best Price Guarantee - We always offer you our lowest available Balearia passenger and car ferries ticket price to and from Alcudia. There are no hidden extras or surprises such as added fuel surcharges or booking fees and we also we do not charge you anything extra for paying with a Visa Electron card. The price we quote for your selected Alcudia ferry ticket, onboard accommodation and vehicle type is all you will pay, and that's a promise! In the unlikely event you find the same all inclusive Alcudia ferry ticket cheaper in the brochure of any other tour operator we promise that we will do our best to beat that price or offer you the choice of requesting a refund. To book Alcudia car and passenger ferry tickets please click here. At ferryto.co.uk you are able to obtain live Alcudia ferry ticket prices, check availability and book car and passenger ferry tickets to and from Alcudia at our lowest available ticket price. Ferryto.co.uk is part of the world's largest online ferry ticket distribution network providing the ability to book over 80 major European ferry operators including to Alcudia and to over 1,200 other ferry routes throughout the UK, France, Spain, Ireland, Holland, Eastern Europe, the Mediterranean, the Baltic and North Africa.